When Bring It On: The Musical opened on Broadway in 2012, audiences had only five months to catch the show before it was unceremoniously taken off the Great White Way. Using the limited engagement to their advantage, the Sydney performance of the musical, based on the cult Kirsten Dunst film, lacks what the original production had in cheerleading ability, yet still engaged all the young women in the audience. The plot centers on newly elected captain of the Truman High School cheerleader squad, Campbell who receives a letter informing her that she has been redistricted to dodgy Jackson High School, who don’t even have a cheer squad. Having to leave her boyfriend Steven, and her long awaited position on the cheer squad, to Jackson where she is outcast by the crowd, Campbell convinces the hip-hop dancing crew to run in the national championship when she discovers a conspiracy theory against her. The story, a vast change from the original film, takes time to get moving. The opening number, obviously attempting to be loud and profound, is the first in a string of failed songs to grab the attention of the audience and appeared to be more like warm ups to the rest of the show. Fortunately the culturally diverse and strong students of Jackson inject some energy into the story and add overall refreshing ideas to the musical. Unfortunately the final cheer routines of both Truman and Jackson are underwhelming and ultimately the ending of the performance falls flat because of it. Alex Lewtas is pleasant as Campbell and hits all the notes of the character perfectly, and Jessica Van Wyk shines as Skylar, Campbell’s frenemy from Truman. Justin Hitchcock is reasonably good as Campbell’s boyfriend Steven and Jaime Hadwen excels as Eva, the girl poised to destroy Campbell. However, it’s Kat Hoyos, Kirsty Sturgess and Timothy Langan, the unforgettable trio, who are truly incredible in their roles as Danielle, Nautica and La Cienega, respectively. Not to forget Sophy Carrol as Bridget, the infectiously hilarious basket-case of the squad that makes the show all worth it – hope to see her around more soon. 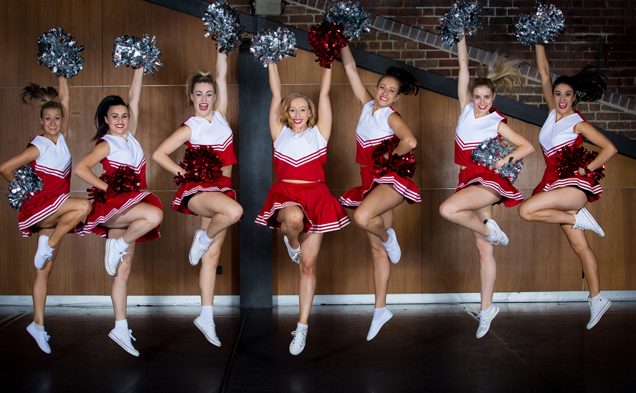 Many of the cast in Bring It On are new to professional musical theatre, most of which are trained dancers with their first cheer experience in this production. And sadly it’s easy to tell. The production comes across amateurish and is truly dreadful at times. Deciding to put on such an ambitious production, especially when so much of the plot revolves around a skill/sport so specific that all performers on stage should be fluent in to seem realistic, may not have been the wisest choice for the producers. However the enthusiasm of the performers is something to be taken into account and appreciated. But if you’re looking for a fully polished, solid and fantastic show, look elsewhere.